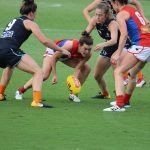 ONCE again, multiple changes across all teams makes for an interesting round of football in the Victorian Football League (VFL) Women’s competition. 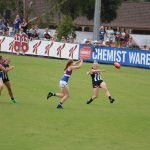 Young guns continue to re-emerge following their Under 18 championship commitments, while plenty of AFLW talents cycle through the teams. All in all, this makes for yet another exciting round of women’s football, kicking off with Carlton v Richmond on Saturday morning. Darcy Vescio returns this week for the Blues when they take on Richmond at Ikon Park. She will be an important inclusion this week and hopefully her goal sense and expertise on the field will get Carlton across the line. This AFLW veteran comes in alongside the equally experienced ruck, Alison Downie and AFLW defender, Kerryn Harrington. The young line-up of Bailey Schultz, Isabella Gietzmann, Jorga Borg and Rene Caris headlines the inclusions for the Round 12 match, with Carlton looking to showcase its up and coming stars. Nicola Burns has also been named in. North Melbourne AFLW recruit, Emma King and new Greater Western Sydney (GWS) forward, Christina Bernardi headline Richmond’s changes this week, both coming into the Round 12 team. Another exciting in for the Tigers this week is ruck, Alice Edmonds who missed last week’s clash against NT Thunder. These three inclusions take the places of Jacinta Louttit and Louise Bieniara who have been sidelined. The Southern Saints will be desperate for a win this week after their three-point loss to Melbourne Uni in Round 11. They have made five changes ahead of game day including former Carlton AFLW player, Alison Brown, who will be a welcome addition to the side. Steph Binder, Shelley Heath and Sarah Gordon have also been named in. 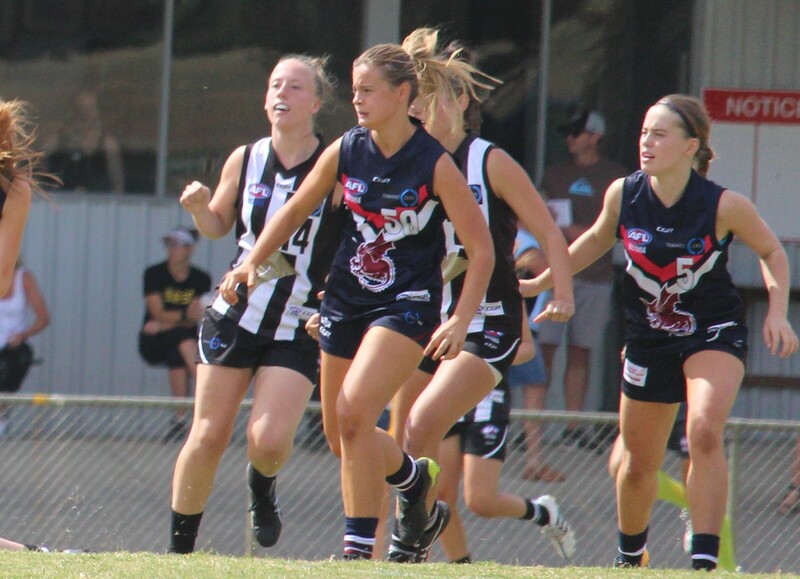 The final inclusion for the Southern Saints is debutant, Holly Bate who has been named as the 23rd player. After impressing at the recent AFL Womens’s Under 18 Championships, the Sandringham Dragons forward is an exciting addition to the team, and hopefully her previous goal kicking form follows through this weekend. The Saints will face the Hawks this weekend who are coming off their Round 11 bye. After their week off, Hawthorn hasmade some key changes for Round 12. Pepa Randall has been welcomed back to the starting 22 this week, alongside Steph Carroll and Emily Mcilvena who have been elevated to the starting team after being named as emergencies in Round 10. Adelaide listed AFLW player, Sarah Perkins is another big in this week, and she will take the field with the Eastern Ranges duo, Mikala Cann and Emerson Woods who have also been named in. It will be a momentous day for Thunder when they play the first ever VFLW match to take place on TIO Traeger Park oval in Alice Springs this weekend. 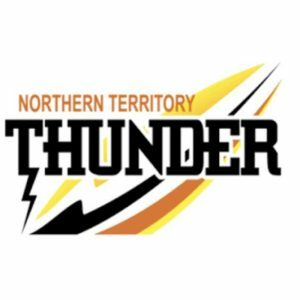 To suit the occasion, the NT Thunder will have extra reason to fight for a big win in front of their home crowd. The side has made 13 changes ahead of the clash with the Casey Demons including 18-year-old, Katelyn Rosenzweig who is set to debut as the 23rd player. 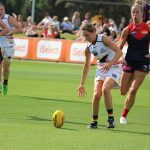 She is a part of the Adelaide Crows Academy and was the leading goalkicker in the SANFL competition, making her an exciting prospect. After being named out in Round 11, captain Angela Foley will be a welcome addition to the side in one of many changes. Michelle Ellis, Jessica Allan, Sarah Allan, Jasmine Anderson, Kylie Duggan, Jenna McCormick, Tayla Thorn, Machaelia Roberts, Jemma Iacono, Tahlia Holtze and Kristy Irvine have also all been named in. The Casey Demons have made five changes for their Round 12 side. Young gun, Darcy Guttridge, AFLW Academy member, Brooke Struylaart and AFLW star, Bianca Jakobsson will be welcome additions to the field this week. Shelley Scott and Georgia McLean have also made the cut. Scott comes in for her first game in the VFLW this year but not without plenty of experience, having played in Melbourne’s AFLW side. Former Adelaide player, Talia Radan also comes in for her first VFLW game, after being signed earlier in the month as a 2019 AFLW recruit for Melbourne. She will be joined by Gippsland Power and Vic Country defender, Emily Hauesler who will come into the side as the 23rd player. On the other hand, Casey will be going without AFLW player, Claudia Whitfort, as well as Amanda McDonough and Holly Bailey who have all been named out. Melbourne Uni will be looking to continue its strong from from last week against the Saints when it takes on Collingwood this weekend. Big names come both in and out of the side this week with recent North Melbourne AFLW signings, Kaitlyn Ashmore, Emma Kearney and Katherine Gillespie-Jones all being selected to play. However Sophie Abbatangelo and Danielle Hardiman, who are also 2019 North Melbourne recruits, have been sidelined. Kathryn Klatt, Jessica Anderson and Emma Humphries have also been named in, while Rhiannon Green, Asha Price, Clara Fitzpatrick and Rebecca Webster have been named out. Exciting Tasmanian prospect, Loveth Ochayi comes in as the 23rd player. 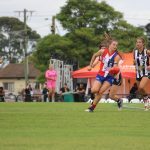 The undefeated Pies, sitting on top of the VFLW ladder have made five changes ahead of their match-up this weekend. Fitzroy junior, Sarah King comes back into the side this week, alongside Stephanie Yoannidis, Hillary Grubb and Oakleigh Chargers captain, Hannah McLaren. McLaren will be joined by another captain in Collingwood AFLW captain, Steph Chiocci. Chiocci will replace the experience lost from Ruby Schleicher who has been named out. Stacey Livingstone, Erica Fowler and Chloe Leighton have also been named out. TAYLA Harris has been named in Carlton’s new-look side this weekend, after the Blues made drastic team changes following their devastating loss to the Dogs last week. Harris will be expected to return to her impressive form after being sidelined in round four due to suspension. Carlton are clearly hungry for a win against Adelaide with five bold changes to their team line up, including the addition of experienced defender, Danielle Hardiman and exciting forward, Lauren Brazzale. These players should add the tenacity that Carlton will be needing this weekend, as they look to get their season back on track. Former Waratah Warrior, Abbey Holmes will not be taking the field for Adelaide this Saturday against the desperate Blues, following her disappointing performance in round four. 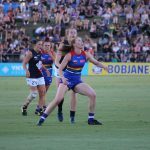 Georgia Bevan is a surprise out of the Adelaide side, after stringing together a couple of consistent performances in recent weeks. However, the Crows regain defender, Dayna Cox for the match at Norwood Oval. A series of changes to Melbourne’s round five side should give Demons fans lots to look forward to, after a disappointing loss to Collingwood last week. This comes in the form of two young guns in former Bendigo Pioneer, Eden Zanker and former state netballer, Claudia Whitfort. Unfortunately, the Demons will be without star defender, Meg Downie who is riddled with injury. Their opposition, Brisbane have only made one change for the week sitting comfortably at second on the ladder. Fremantle and GWS have each made two changes to their side in preparation for their clash this Saturday. Swan Districts recruit, Tayla McAuliffe will make her debut for the Dockers, and will start at centre half-back. She is likely to be used in the ruck as well, alongside teammate, Alicia Janz. Therefore, McAuliffe will have the tough job of battling against GWS’ Erin Mckinnon, who has impressed on multiple occasions this season. While the teams will not be finalised for Sunday’s match until Friday at 5:00pm, Collingwood and the Western Bulldogs have each included two players in its sides. One exciting in for Collingwood is Western Spurs recruit, Bree White. 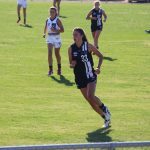 Her experience in the midfield should continue to bring stability and skill to Collingwood’s side, as they hope to continue from last week’s success. For the Bulldogs, Deanna Berry comes back into the side, hoping to help get her side over the line in Moe.